How Do Clients See Freelancers? 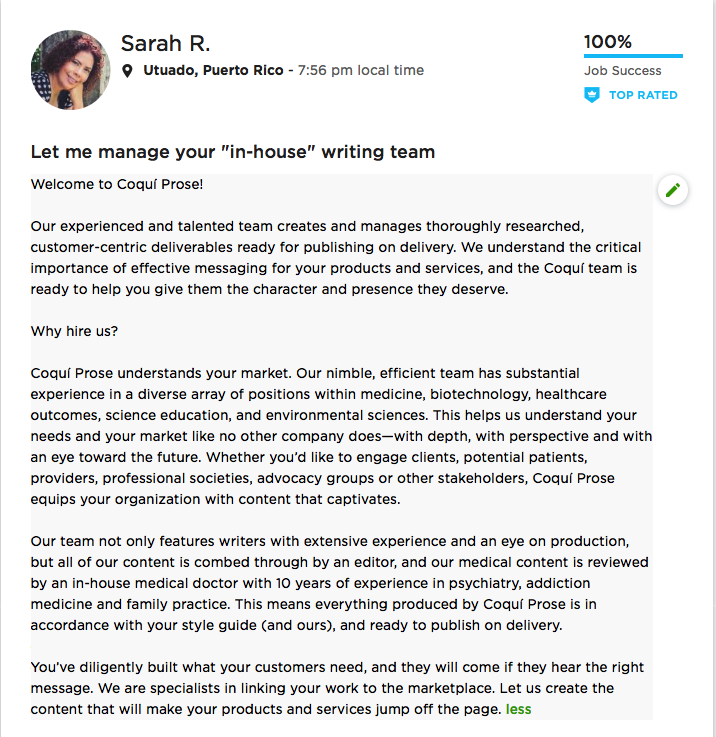 Many people know me as the owner of Coquí Prose, but I am also a prolific client who frequently uses Upwork to hire freelancers. Although many of you may have hired a few other freelancers to fill the occasional needs of a client or to assist with specific projects, I work day in and day out with a team of freelancers who help meet the goals of our long-term clients. For every job I have with a client, I may hire five or more team members to fill the needs for that client. 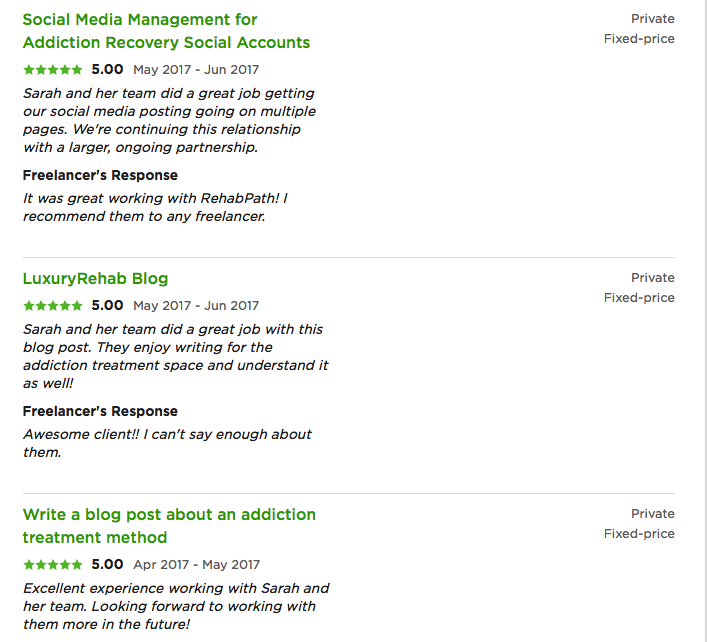 With more than 1000 jobs awarded since I started hiring on Elance/Upwork about eight years ago (both one-off jobs and ones lasting six months or longer), I see the business of freelancing from a very unique perspective. Let’s start by debunking three common myths that frequently lead to lots of chest-pounding, self-aggrandizing and pontification ad nauseam. These are myths I have read in online forums again and again and, sadly, a-gain. "You need a degree to be a content writer." Rates: What Matters? Your Past, Present or Future? Oh yeah, that myth that no serious clients will look twice at someone who used to charge low rates? It’s simply not true. As a freelance ghostwriter, I started out as low as it gets. I can assure you my clients—all of whom are quite serious—pay no attention to what I earned as a solo freelancer back when I started years ago as they're considering us for their job today. As they're going through the same ritual that I describe, they don't have time to notice, and they really don't care anyway. As a client, when I look through your old jobs, I don't care what you charged in the past. In fact, I would hope you’ve raised your rates at some point and that you continue to raise your rates. All that matters as far as money goes is what you want to charge me for this job. Is it something I can afford? What I do seriously care about are how your profile reads and the feedback previous clients have left for you. Briefly about your profile: it's not about you. It's about speaking to prospective clients. Freelancers tend to wax and wane about how wonderful they are. Turn off! Tell me what you can do for me and why I should hire you. I don't care about your awards, that you're a stay-at-home mom or that you came in 1st in the spelling bee. I want to read your profile and know you had me in mind when you wrote it. And no I'm not egotistical, I just want to know you've thought about what your ideal client looks like and you've addressed it in your profile. If I see a pattern—in one direction or another—I sit up and take notice. I don't care about the number of stars clients gave you. I care about the words they use in their feedback. I am adept at picking up when a client is leaving nice feedback because they probably liked the freelancer as a person but didn't think much of their work. I also never look at a freelancer with less than a 92 percent job success score. Why should I when there are many Upwork freelancers with 95 or better? Writing proposals is both a skill and an art. So much so that I wrote an entire blog about it and I only scratched the surface writing it. I’ll give you the high level and I'll post that blog in the coming weeks. Resist the urge to tell your prospective client you’re absolutely amazing over and over and o v e r a-z-z-z-z-z. Fewer things put me to sleep faster than someone who’s in love with themselves. Here’s a clue: the job isn’t about you. It’s about me and my needs. Address them in your proposal. Don't get me wrong. I'm not trying to imply that I am not interested in who you are as a person. In fact, if I'm impressed enough to want to call you for an interview, I'll want to find out who you are. Personality is as important to me as expertise. I just don't want to know all that in your proposal. In a discussion I was having with a colleague, she phrased it very succinctly. Do You Need a College Degree to Be a Content Writer? No. You need to know how to follow clients' instructions. You need to have a really good grasp of grammar, punctuation and syntax. You need to know how to structure an article. None of those skills requires a degree. If you don't feel your grammar, syntax and punctuation are great, you could learn but it's difficult to learn that and become a writer. I have suggested to freelancers they buy a copy of The Elements of Style by William Strunk, Jr. and E.B. White. Evidently you should try and find an edition prior to the 4th one, though. Seems this particular edition is accurate but formatted by someone with my own design sense. Whether you use a bidding site or you contact clients through various job postings, these tips will apply—except, of course, if you aren't using a bidding site, clients can't see your profile. In this situation, if you don't have a website or a portfolio of your work, get one STAT. Good luck.